Yes, but you must finish in 3 hours, 30 minutes (16:02 per-mile pace) or less, after which you are on your own. Volunteers, water stops, law enforcement, finish line crew – all will be gone after 3 hours, 30 minutes. Are there separate awards for walkers? Yes, we will give awards to the fastest three male and female walkers, so if you sign up as a walker, you must walk the entire race to be fair to all competitive walkers. You are on the honor system. Packet pick-up is 4:30 p.m. – 7:00 p.m. Friday, Oct. 18 (no early birds please), at the Kentucky Music Hall of Fame, 2590 Richmond Rd., Mt. Vernon, KY 40456, or 7:00 – 7:45 a.m. on race morning at the race start area at Renfro Valley Entertainment Center, 2380 Richmond Street, Mt. Vernon, KY 40456. 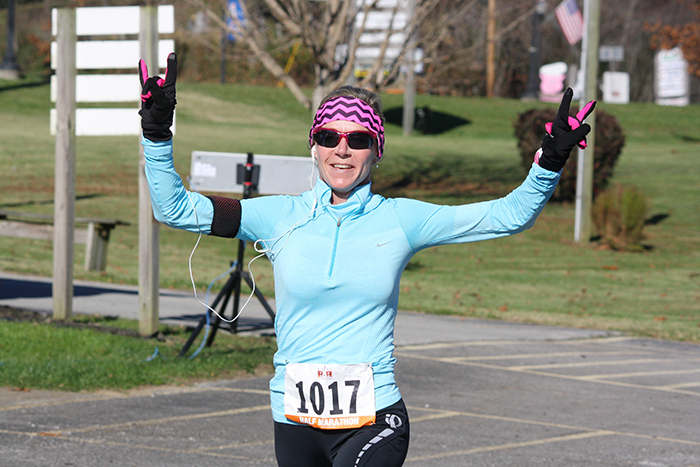 Half marathon race time is 8:00 a.m. (5 Miler/ 5K race time is 8:05). Yes. We encourage you to pre-register, but registration will be available on race morning from 7-7:45. T-shirts are guaranteed only for those who register by Oct. 14. Click here to register. Not this one. For safety reasons, no wheels of any kind are permitted for this race. No. For safety reasons, no pets are allowed for this race. If I register but can’t make the race, can I get a refund? No. Unfortunately we cannot offer refunds. 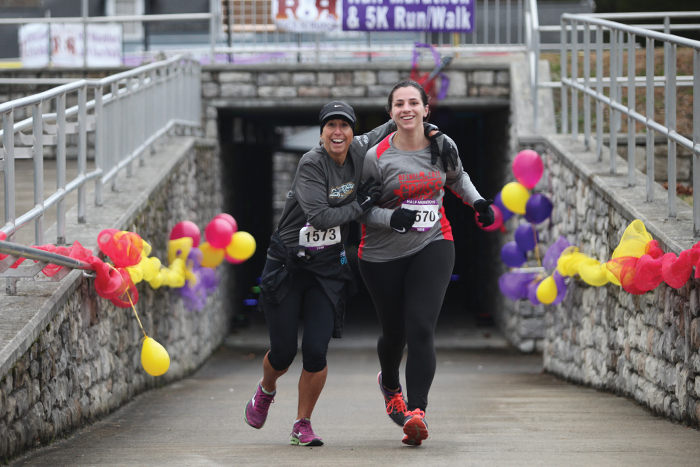 You may transfer your registration to another runner for a $10 fee if you do so by Oct. 14 at 4:00 p.m. (Half marathon only). To transfer, call Kayla Prewitt at 606-256-7767. Is this part of the County-Wide Stride? Yes. 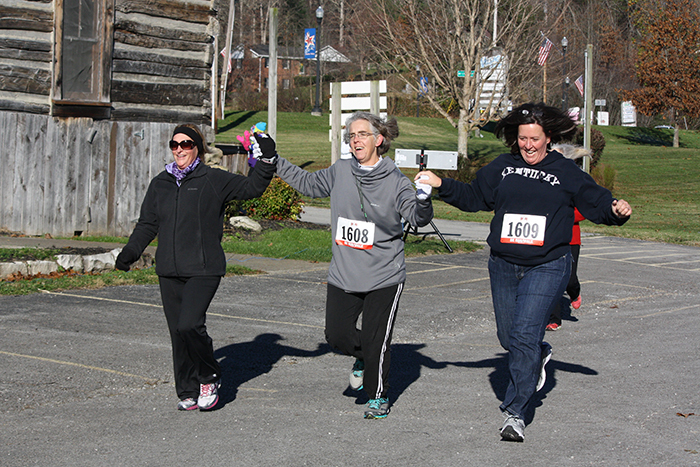 The half marathon, 5-miler and 5K are part of Rockcastle Regional Hospital’s County-Wide Stride race series. Click here for details on how to qualify for incentive prizes. How many aid stations will there be on the course? There will be 9 water/fluid stops and 6 porta-potty opportunities. Is the course closed to vehicles? No. We do our best to clear the road of vehicles in the first 15 minutes of the race, but the course cannot be completely closed. Signs are posted at critical points warning motorists that runners are on the road. We have law enforcement and firefighters on the course, as well as volunteer motorcyclists (they are clearly identified) who patrol the course during the race. Race staff vehicles will pace the race and also follow the last runner/walker. SWORD hydration and water on the course and at the finish. We’ll also have bananas, cereal bars, sausage biscuits, coffee and hot chocolate at the finish. Where and when can I see the race results? Results will be emailed to you immediately after the race. They will also be posted on our Facebook page on race day and put on our website soon after. Sure! Renfro Valley Entertainment Center is a Kentucky tradition that goes back generations. It offers restaurants, gift shops, and many kinds of unique attractions. You might also want to take in a show on Friday or Saturday night. For more information, go to renfrovalley.com. There’s also the Kentucky Music Hall of Fame and Museum, which honors Kentucky’s finest musicians and performers. Be sure and eat a tasty, celebratory lunch at Back Porch BBQ, who provided the delicious breakfast biscuits. 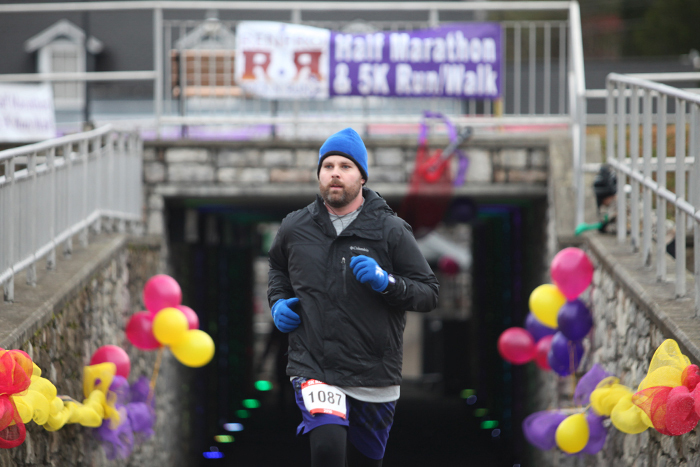 Can I walk the 5-Miler and 5K? Awards will be given to the top three male and female walkers. We’re on the honor system – you must walk the whole way to be eligible for the award. Yes. 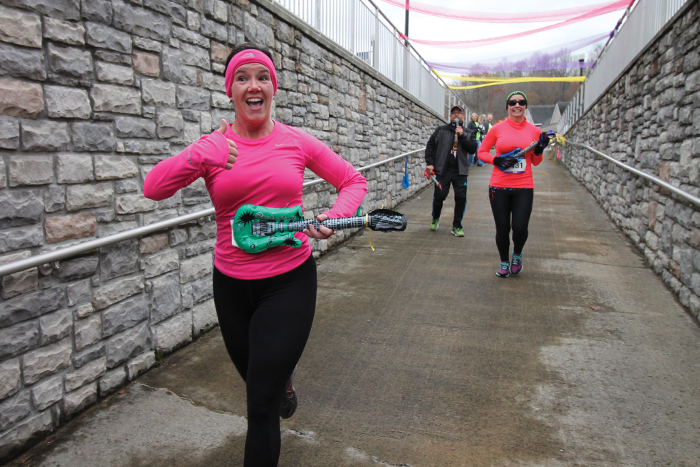 We encourage you to pre-register, but registration will be available on race morning from 7 – 7:45. T-shirts are guaranteed only for those who register by Oct. 14. Click here to register. Packet pick-up is 4:30 p.m. – 7:00 p.m. Friday, Oct. 18 (no early birds please), at the Kentucky Music Hall of Fame, 2590 Richmond Rd., Mt. Vernon, KY 40456, or 7:00 – 8:45 a.m. on race morning at the race start area at Renfro Valley Entertainment Center, 2380 Richmond Street, Mt. Vernon, KY 40456. Race time is 8:05 a.m.
No. We do our best to clear the road of vehicles in the first 15 minutes of the race, but the course cannot be completely closed. Do these races start at the same time and place as the half marathon? 5 Milers and 5K’ers will line up at the starting area (behind the half marathoners) at 7:55 a.m. Half marathoners will start at 8:00; 5 Milers and 5K’ers will start at 8:05. Both the 5 Mile and 5K course are out-and-back and will finish at the same place as the half marathon. Can I push a stroller or run with a pet? No. 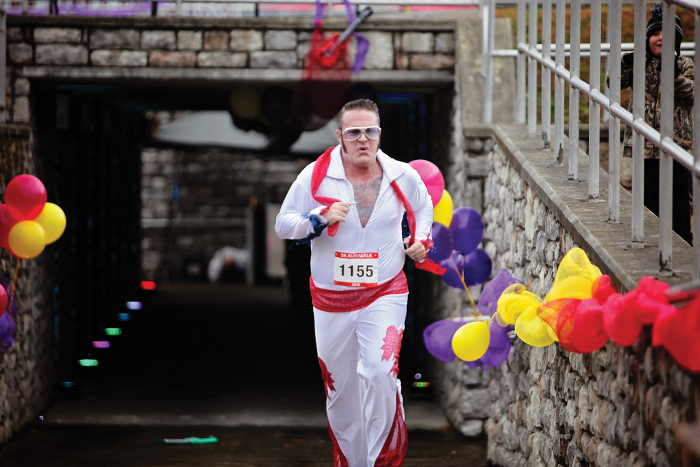 We allow this for most Countywide Stride events, but at this race, we anticipate hundreds of participants. Pets and strollers present too many hazards. Will there be hydration on the course? Yes, at the start/finish and at the 1-mile and 2-mile point. (Since it’s an out-and-back course, you will pass the station twice).